If you're a popcorn lover, you might be secretly hoping this popular snack is a healthy one. However, discovering whether popcorn is healthy is not so straightforward. Some types of popcorn are healthy, while others expand your waistline and can boost disease risks. Popcorn is a whole grain and a healthy source of dietary carbohydrates. It's also a good source of fiber, which helps boost satiety, is beneficial for digestive health, and aids in healthy weight management. A 3-cup portion of unsalted air-popped popcorn provides just 90 calories but almost 4 grams of dietary fiber and 3 grams of protein. MedlinePlus suggests adults aim to eat 21 to 38 grams of fiber daily, but notes Americans eat just 16 grams per day on average. Another perk of popcorn is it's naturally free from cholesterol and trans fat. The healthiest popcorn choices are unsalted air- or oil-popped popcorn without butter. Air-popped is the lowest calorie option, providing just 30 calories per cup, and oil-popped popcorn adds an extra 10 calories (or more) in each cup. Lightly salting your popcorn is generally okay, as long as your total daily sodium intake doesn't exceed recommended amounts. Because many pre-packaged popcorn brands contains lots of sodium, butter, or both, popping your own popcorn is beneficial. Getting too much sodium in your diet on a regular basis greatly increases your risk for high blood pressure, heart disease, and stroke. The American Heart Association recommends aiming for no more than 1,500 milligrams of sodium daily, but says limiting sodium to 2,400 milligrams per day is a good place to start. Just 1/4 teaspoon of table salt contains 575 milligrams of sodium. Read the food label on pre-packaged popcorn to determine how much sodium you're getting in each serving. One portion of popcorn (1-ounce equivalent of grains) is equal to three cups of popped popcorn, according to the U.S. Department of Agriculture. Adults generally require five to eight servings of grains daily, depending on age, gender, and activity level. This equates to 15 to 24 cups of popped popcorn daily if you get all your grains from popcorn. However, it's best to eat a variety of whole grains (like brown rice, quinoa, and oatmeal) each day, not just popcorn, to get a good balance of different nutrients in your diet. So when eating popcorn as a snack, aim for about three cups as a rule of thumb. Many types of popcorn aren't so healthy, containing added calories, sodium, saturated fat, or sugar. Heavily buttered and salted popcorn, like movie-theater popcorn, should only be eaten in moderation -- or avoided entirely to keep your waist slim and heart disease risks low. Another type of popcorn to steer clear of due to high calorie and sugar content is caramel popcorn, which can contain over 200 calories per cup. Cheese popcorn is often high in sodium and saturated fat, so consume it sparingly. Some people have concerns about chemical emissions associated with microwave popcorn and the bags they are popped in. One 2007 study found chemical emissions happen when popcorn bags are first opened post-popping. A 2014 study reports perfluorocarboxylic acids (PFCAs) were found in popcorn bags, but these chemicals weren't present in the popcorn itself. So, if you're worried about chemical emissions, it's probably best to pop your own popcorn. Likewise, microwave popcorn may be high in fat, sodium, and calories, so read nutrition labels carefully if you do opt for microwave popcorn. Popcorn (with the exception of heavily buttered, cheese, and caramel popcorn) is a healthy snack that is rich in fiber and fills you up without the extra calories. 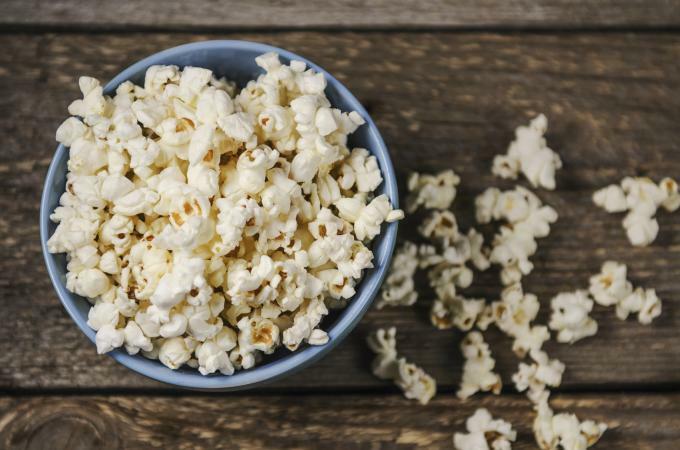 Because popcorn is a whole grain, it can keep your waistline trim and disease risks low as long as you don't top it with high-calorie flavorings or excessive salt.